I've now been visiting this remote little church for twenty years. I love to cycle around the back lanes of Suffolk as summer becomes autumn, the land quietly putting itself to bed for the winter, woodsmoke in the air, the edgy cries of pheasants in the woods, the light whitening out as the afternoon lengthens. When I first came to St Nicholas, it was in early October 1998. They were getting their church ready for the harvest festival, one of those very English events which must seem curious to a foreign visitor. Harvest festivals are one of those peculiarly Anglican inventions. Like many such ancient traditions, they actually only date back to the 1840s or so. 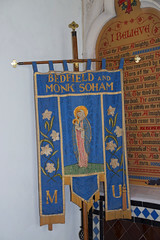 Most Suffolk village churches have them, and do them very well. For some churches, it seems the only time apart from Christmas that the building comes alive. On this occasion, half a dozen people were busy arranging apples, and marrows, and pumpkins, and leeks, piled in crates and carrier bags at the entrance to the church. They chatted as they did so, and it struck me that this was a kind of communion, the parish being together and talking to itself. There is a particular smell to a medieval church filled with fruit and vegetables. Once experienced, it is never forgotten, and instantly draws your imagination back to ancient walls, soft wood and cool tiles. 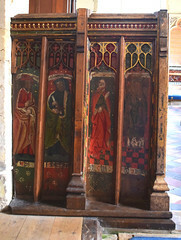 For me, it still recalls the beautiful late medieval roodscreen at Bedfield, lined with apples and onions. I had cycled here along the track from Tannington. Once this leaves the farmyard behind, it becomes the kind of track you'd have found all over Suffolk before the 1920s and 1930s. When you look at an old road map of Suffolk, you find many more byways marked than there are today. Some of them were surfaced, many have disappeared completely. The track between Tannington and Bedfield seems to be still deciding whether or not to settle on the latter option, for at several points it becomes nothing more than overgrown tractor ruts in the mud. But for most of the way it is a gravel track which for part of its route winds pleasantly through woodland. Once, in the last year of the 20th Century, I passed a real gipsy caravan on this track. It was late winter, and the cold afternoon light was fading. The brightly coloured caravan had come to a halt, the little horse pulling miserably at the coarse tussocks on the field side. Behind, a man was working at a makeshift forge, the coals flaring suddenly in the uncertain dusk. He nodded once as I passed. I still don't know if it was real. I came back later in the year on the occasion of the Historic Churches bike ride, and Bedfield church was bathed in the honeyed warmth of late summer. A giant puffball grew by the churchyard gate, and would have made a fine meal if the rats hadn't got to it first. Again the church was busy, a smiling lady at a table signing the forms of a couple of teenage girls with their dad. 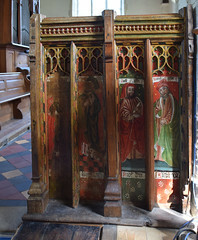 On this occasion, I could see the roodscreen without having to negotiate fruit and vegetables. 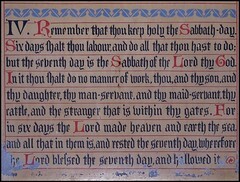 Unusually, the panels contain eight Old Testament prophets in gorgeous reds and greens. The faces of some of the prophets have been viciously attacked with a knife. 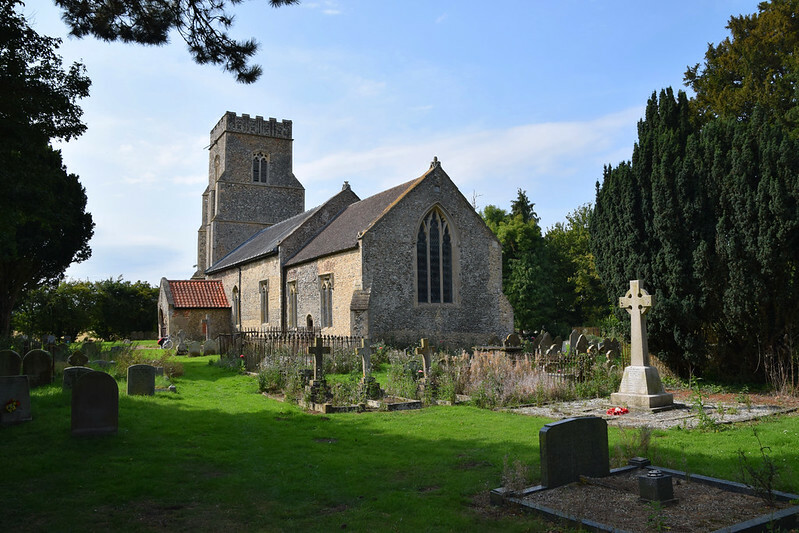 This may have been the work of mid-16th century reformers, but it appears as though the same thing done at Brundish, a couple of miles off, was actually work commissioned by the iconoclast William Dowsing on behalf of the puritans a century later. Dowsing never came to Bedfield, though, but perhaps the Brundish churchwardens did. We stood together, the smiling lady and me, imagining the past. Why even do it? It may simply have been a result of the injunction against images, that fundamentalist mistrust of the beauty of the human face being depicted. We have had a reminder with the evils meted out by the Islamic State in Syria and Iraq that fundamentalism never did anybody any good, and the terrors of the Cromwellian night extended far beyond destroying artwork. As Erich Maria Remarque observed, tolerance is the daughter of doubt. So it gives me immense pleasure to see that behind the wicked knife slashes, the prophets seem a jolly lot, with smiles on their faces and the attitudes of old friends having a good time. Perhaps that is why they were attacked. 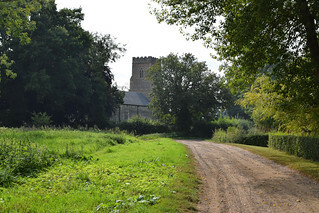 St Nicholas sits on the edge of another farmyard, although a proper road connects it to the fine pub and the village beyond. 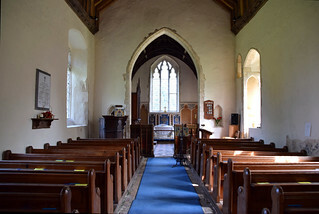 The tower dates from the 14th century, when the entire church seems to have been rebuilt, although there's quite a lot of evidence of the earlier church, including a fine Norman north doorway. There are three niches on the west face of the tower. 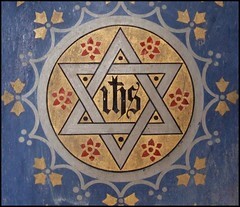 From their relationship with each other, we can deduce that they probably contained a rood group. 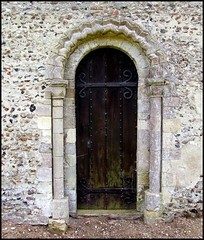 Peter and I came this way in June 2007, as part of my plan to revisit the 650-odd Suffolk churches I had explored more than six years earlier. 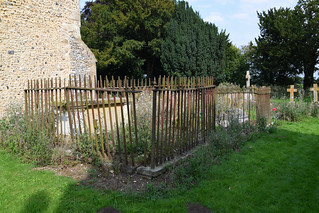 Quite honestly, we didn't expect to get in, because what I haven't mentioned was that, in those days, Bedfield church was just about the only medieval church in this part of Suffolk which was kept locked without a keyholder. However, as with several other places in the area on this beautiful day, St Nicholas was undergoing its spring clean. The grass was being cut, the benches polished, the floors mopped. In fact, they were just finishing, cars pulling off. As we walked up the graveyard path, we met the keyholder coming the other way. She was very kind, and very helpful. She went and checked with her husband that it would be okay for us to see inside, and then let us into the Priest door, and we stepped inside to the trim interior. The church is smaller than it looks from outside. 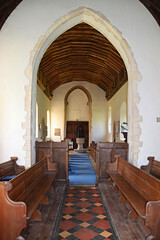 There was a major restoration in 1870, which left St Nicholas looking the very model of a rural parish church. The brick floor is an organic setting for some lovely rustic woodwork. 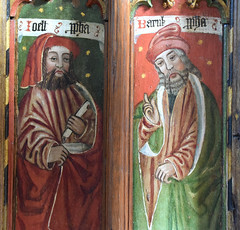 It seems that the village had an enthusiastic carpenter in the late 17th century, for the group of benches by the door, the font cover and the pulpit all date from this time The benches are haunting, and it doesn't take much to imagine our ancestors tight-packed on them, shuffling their bottoms awkwardly at the preaching of the Word. I assume that most churches once had benches like this, and that they were destroyed at the time of 19th century restorations. 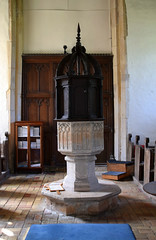 The font cover is intricate, and it opens up without the need to remove it, as at Bramford and Boxford. This was all well and good, but something was nagging me as we poked around. 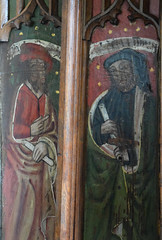 And then I was startled to notice that the rood screen had gone. Now, this isn't the kind of thing you usually expect. Surely it couldn't have been stolen? Fortunately not, for I was told it had been removed to be cleaned by the artist Christine Easton, who lives in the village, and would shortly be returned. 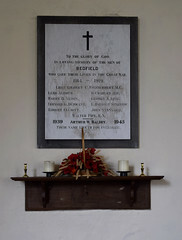 When it came back, so did I. I had also been told that Bedfield church was now open every day, so with some enthusiasm I cycled down the track from Tannington again, which twenty years on is now near impassable in places, necessitating getting off my bike and lifting it over rubble. Ahead of me, St Nicholas was beautiful in the early autumn sunshine, a diadem at the end of the long track. I stepped inside to its instantly familiar homeliness and small-scale elegance, to the sight of the old screen as if it had never been away. 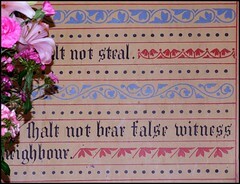 Beyond the screen, the sanctuary was a riot of tiles and gothic lettering. vibrant in the light. 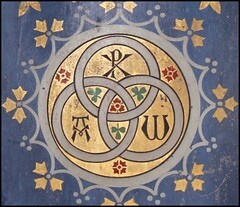 Decoration of this type was deeply unfashionable for most of the twentieth century, and it did well to survive. 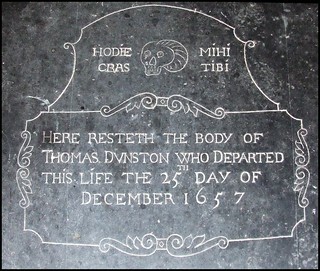 A poignant ledger stone to Thomas Dunston bears a simple skull and the inscription Hodie Mihi, Cras Tibi ('Mine today, yours tomorrow'). It is dated December 25th 1657, which is Christmas Day for us, but not for Thomas Dunston, for this was during Oliver Cromwell's Commonwealth, and the celebration of Christmas, like so much else, was illegal. Hard to imagine, now, perhaps, although intolerance survives like a virus in abeyance, and always needs to be guarded against.